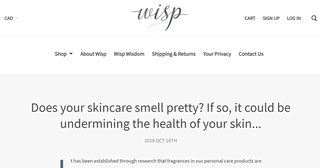 Wisp collection is a luscious skincare line that is suitable for most skin types. We removed toxic ingredients, like Formaldehyde, Sulphates, Phthalates, Parabens, Hydroquinone that are known health and skin hazards. Then we looked at ingredients that are potentially sensitizing to the skin, like Dyes/Colorants, Fragrance (including essential oils) and removed those, too.